Falcade ski resort is a great choice if you are looking for not only skiing for different levels, but also striking and enchanting dolomitic views during your ski holidays. Visit the village to let the good time roll and be sure that your holidays will have a perfect start with Alps2Alps ski transfer. 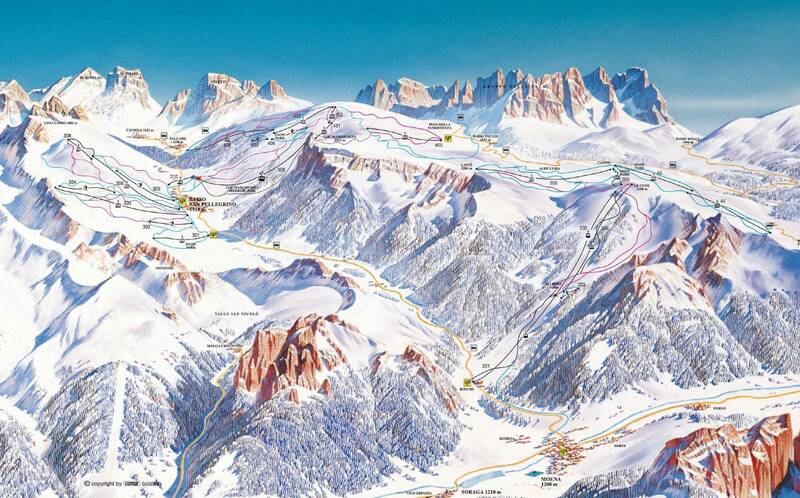 This Italian ski resort is part of the Trevalli ski area. Falcade is located in a sunny valley surrounded by Dolomites. It is a typical Italian mountain village especially popular amongst Italian tourists. The skiers loves the slopes which are always warmed by the sun combined with spectacular scenery. When visiting Falcade, don’t forget to enter the Church of Falcade which is a notable landmark. There are no direct trains to ski resort itself. The closest train station is Belluno and Ponte Gardena. When it comes to pricing, we avoid flat pricing structures for customers looking to book Falcade transfers. We are taking a dynamic approach, taking into account the specifics of your transfer, to make you the best possible price offer every time. All of this above will result in base-rate for ski transfers going down - we never over inflate our prices at any time or for any reason. In fact we offer substantial discounts for off-peak, off season and midweek (Monday-Friday) transfers to Falcade. When choosing midweek transfer the prices will be with up to 60% discount than weekend prices. Falcade is a perfect destination for all skiing enthusiasts who are looking forward to stylish holidays - from first-timers to seasoned pros, there is plenty to offer for everyone. Falcade offers many services for families - starting from ski schools and ski kindergardens to great discounts to make to journey even more enjoyable. This is a perfect destination if your family not only wants to ski, but also experience breathtaking views all day long. If you’re searching for the best price and best quality for your transfer, Alps2Alps will be the best choice. We provide you the best service and the lowest possible price. You can trust when it comes to reliability, punctuality and flexibility. Start your ski holidays at Falcade with a smile by choosing Alps2Alps. Remember to book in advance to get best possible price and if you have any questions don’t hesitate - get in touch with our customer service team today. Whatever it takes to get you there on time and in comfort, you can count on us - Alps2Alps!